The ION holiday move A Christmas in Royal Fashion will debut on December 16 at 9 PM. Kristin Cooper (Cindy Busby), a talented assistant for a global PR firm, is put in charge of the annual Christmas fashion show and auction for clothing entrepreneur, Mr. Carson. A handsome young royal, Prince Patrick (Diarmaid Murtagh), is dispatched by his father, the King of Edgemoor, to be the face of the family co-sponsored event. Upon his arrival to Beverly Hills, Patrick meets Kristin and is instantly smitten with her, mistakenly thinking she is actually her boss, Melanie. While Patrick and Kristin spend the Christmas season together in California, she wonders if Patrick would have still fallen for her if he knew she was an assistant, and not the boss. The film also stars Michael Pare. 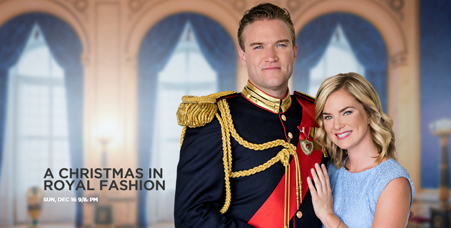 Here is a trailer for A Christmas in Royal Fashion.